The City of Whitehorse is located in the middle-eastern suburbs of greater Melbourne. It’s a beautiful place to live, characterised by quiet tree-lined streets and an abundance of parks, gardens and natural bushland reserves. Whitehorse is home to a culturally diverse community of 173,233, with 38% of residents born overseas and 11.5% from China. 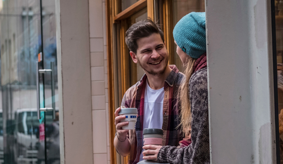 The student population also continues to grow, with international students choosing to study at nearby Deakin University and Box Hill Institute of TAFE. With a new vision to digitise customer experiences, GreenBe helped the City of Whitehorse navigate and deploy its very first city-wide customer-facing digital platform to residents and SME business owners. After 12-months the City of Whitehorse successfully activated more than 1,600 households, an audience of approximately 4,160* residents. Turn-key cloud solution deployed city-wide in under 12-weeks. Platform to incentivise residents for engaging in sustainability and waste services. Direct marketing and behaviour change system enabling Whitehorse to engage with hard-to-reach customers, including transient student population, non-English speaking residents. Rewards program with no direct costs to Council for the delivery and fulfilment of rewards and discount offers at local businesses. Digital services and portal for local SME businesses. Professional services, including training, customer support, strategic digital marketing and creative design. Compared to other digital channels Council is able to invest in, a clear benefit of GreenBe’s platform is that all customer data is securely held and owned by Whitehorse and not by a third-party social platform. Rather than investing in costly social media campaigns, where security and privacy are becoming a global concern, Whitehorse now has their very own digital customer platform. Whitehorse is able to reach 35% – 91% of its GreenMoney members at all times via email, push notification or direct message, unlike Facebook’s algorithm which allows for approx. 1% organic reach on posts. Furthermore, in November 2018 an A/B test uncovered the extreme difficulty of measuring the real value of social ‘likes’ and ‘follows’ against education levels and behaviour change. Apart from the Whitehorse corporate website, the city had no other official digital channels targeting residential customers. This proved to be an advantage in allowing Whitehorse to test and compare the effectiveness of engagement channels strategically. Unexpectedly, direct mail (not Facebook and Instagram) was the most effective at driving user acquisition, followed by promotional tags placed on recycling bins as part of Whitehorse’s bin auditing program. 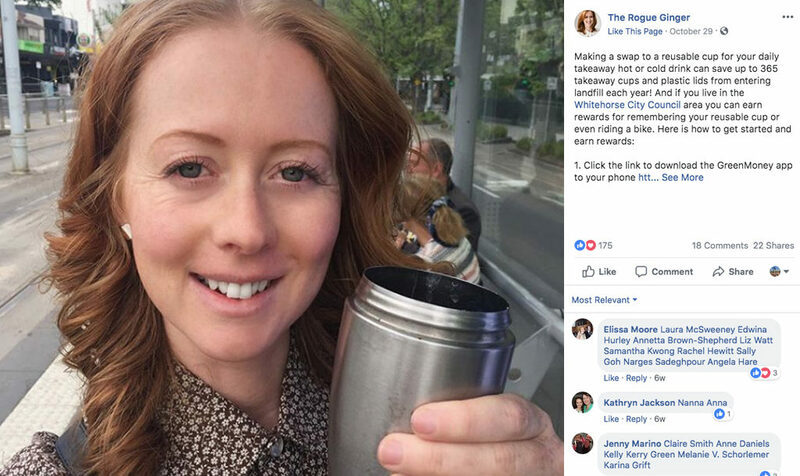 The Rogue Ginger Facebook post promoting Whitehorse GreenMoney. After 12-months the City of Whitehorse successfully activated more than 1,740 households, approximately 4,524* residents. Approximately 42% of all Whitehorse City users live in hard-to-reach low engagement suburbs. In just 12-months, over 3,700+ green behaviours have been recorded (approx. 2.4 actions per household).